So…what’s wrong with this picture? 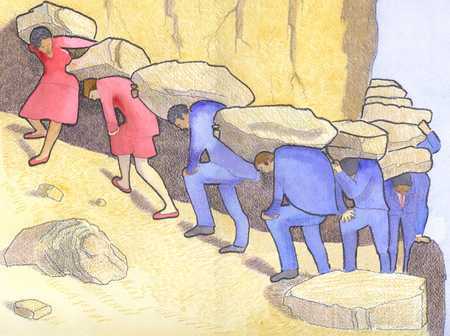 These men and women are all dressed up and carrying ROCKS! Think of the weight that must be on their shoulders as they hike up this mountain in the heat of the sun with no one to help them lift the pressure off their backs. What kind of rocks are you carrying? Feelings of pain, regret, disappointment, discouragement, shame and grief are not feelings that we have to shoulder alone. Through our Savior Jesus Christ, we can be liberated, purified and cleansed. We can essentially become new creatures in Christ. We can make “U-turns” and never go back. The Gospel of Jesus Christ invites all men and women everywhere to repent. The word repentance can seem scary and daunting and can be seen as a process for only our really bad sins and mistakes. But, in the Bible dictionary it teaches us that repentance “denotes a change of mind, a fresh view about oneself and about the world[…] Repentance comes to mean a turning of the heart and will to God.” It isn’t so scary as the results of repentance are an increased feeling of love, peace, joy, happiness, confidence, strength, purity and weightlessness. So, if Alma the Younger, the VILEST of all sinners can be cleansed from his sins, is it possible for us to be purified too? I testify in the name of Jesus Christ that through His gospel we can be transformed. His arms of mercy are extended to all of us and if we will come, he will heal us.